Wrapped up summer camps this week! I've started the Lanterns Unity project, but don't quite have content to show yet. Programming and production will commence in earnest! I have been thinking a lot about how the game will present itself in its opening cutscene. Watching Dunkirk this week I saw how important it is to keep the audience up to speed about what is happening. It's not enough to assume that the viewer or player is familiar with the cultural traditions or history. In Dunkirk, they included onscreen text to explain how dire the situation was during the war. I would like to do a similar thing to explain what the purpose behind the lantern festivals are. I've also considered the writing that will appear on the lanterns. During lantern festivals, families will write messages to their deceased loved ones. I'd like to include some of these messages--perhaps in a variety of different languages. Another option I've been considering is to create messages in an fictional language, and have the players infer the meanings and stories behind each. A game that did this well was Journey, where the story was presented with imagery, and not words. Also, got to tour Sony San Mateo! We checked out their Sound department and got inspired by the music (in Uncharted, Journey, etc). So much detail and care was taken in getting the sound to evoke the right emotions. I am taking time to review how to use Blender (been watching youtube videos), and start modelling the 3D assets needed for my game. This week I created a basic model of the lantern, and the next step is to light it! Modelling out the environment is daunting, I’ve never done such a large project before! On a side note: I brought the Gear 360 out to a family gathering and snapped a bunch of pictures. It was really fun to play with and I'm thinking about recording a biking video, or cat video with it. The bike one would be a short and leisurely bike tour around my neighborhood. I want to show off some of the interesting areas around the creeks and even go off the trail. The cat video would have the camera strapped onto the back of a cat, and it would let us experience life from the perspective of a cat-- really close to the floor! I'll have to figure out how to secure it properly as not to damage the camera, though! Found a little bit of time after work at Girls Make Games summer camps (had fun recording the classroom with the 360 camera, too!) to do these thumbnails for my project. I tried to capture the mix of colors and feelings that would be in the game. Next two weeks are looking super busy, too! 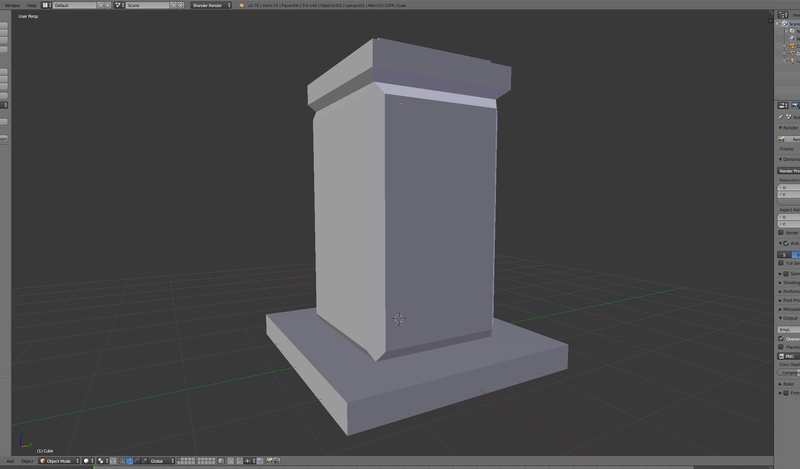 Won't have time to start development in Unity, yet, but I'll be thinking about starting basic modelling in Blender. Development on Lanterns will be slow this month, but I expect to catch up in August. This week I've written the poem that will play out at the beginning of each chapter. The pale white moon glows ever bright. Catching us from moving foward. A slicing wind strikes aboard. O lanterns won’t you float along? Your kindled flames will crackle strong. To their homes in the sky. Starting this week I will be developing the visual style of the Lanterns world. There are three locations and they need to be distinct yet stylistically cohesive. They are: The Village, The River, and The Sky. The Village will be after sunset, golden, lit up by the flames of the lanterns. 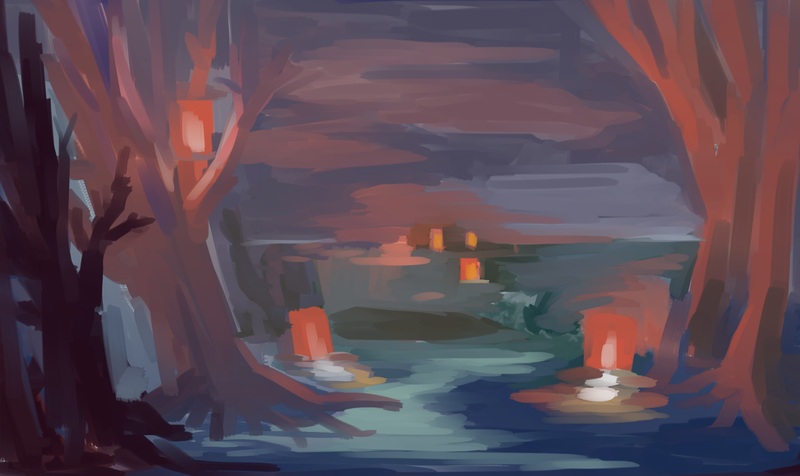 It starts of rather dim, but as soon as the first lantern few lanterns are lit by the player, the entire riverside is crackling and glowing. Some float along gracefully, while others struggle. Every nearby lantern can be interacted with. 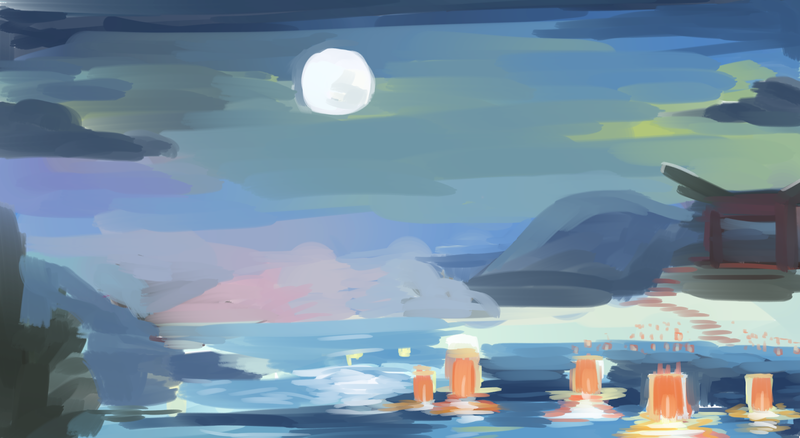 Sometimes the player will reveal the spirit being guided by it, or help nudge the lantern forward, or give it a little bobbing in the water. As you ride away from the village some lanterns begin to rise out of the water. The River will be dark and dangerous, winding, and sullen. The wind tries to prevent your passage. Lights get snuffed out, and the air becomes difficult to breathe. The maze of trees begins to capture lanterns. The lanterns in the air get stuck between the branches, and in the ones floating in the water get trapped by roots and stones. The spirits reveal themselves in distress and call to the player for help. 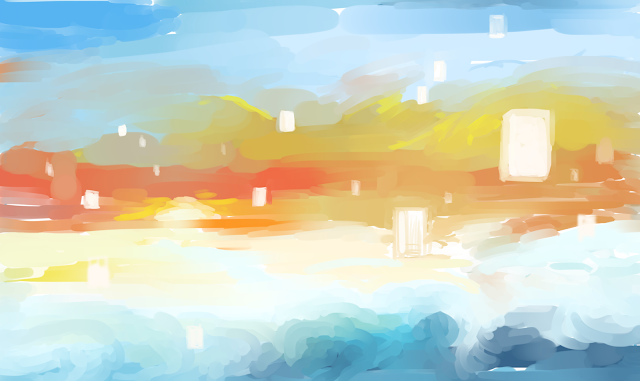 The Sky will be bright, lofty, almost dreamlike. The water in the sky is replaced by rolling clouds. The boat still floats above but the sky is intensely bright and blue. The sun glares upon the top of the clouds. You can only tell the boat is moving because a restaurant with a dock gradually drifts closer. I’m not exactly sure yet what will happen here, but the feeling I’m going for will be that of a sendoff and the last goodbye’s to these lanterns that have accompanied the player so closely during the game. The Boat itself is also currently up in the air. 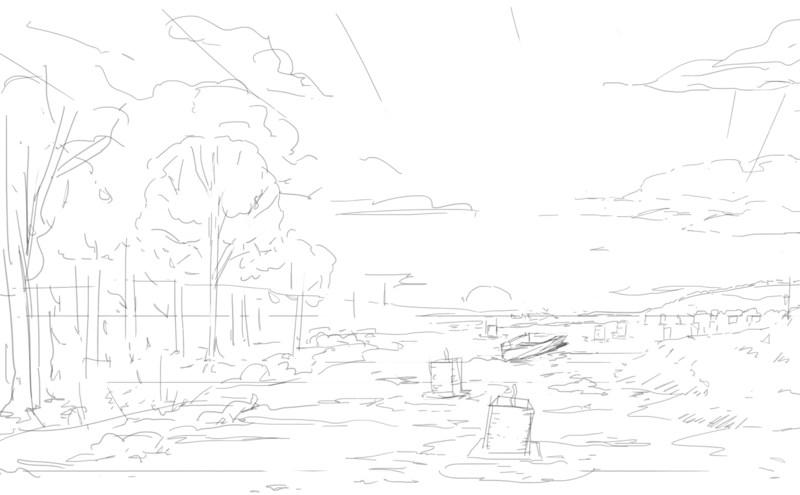 My initial sketches have it as a dingy one-person rowboat (without the need for rowing), such as the one used in by the monks in the film Spring, Summer, Fall, Winter, And Spring. It’s unadorned, cramped, fragile, and solitary. It’s old and well-worn--many trips have been made in it. I’ve also given some thought about the transitions between each section. While one continuous boat ride sounds great on paper, I don’t think it would be engaging without good content to tie together the sections of play. The first method--the most building-intensive, would be to construct the entire river but make it interesting all the way through. The second method--animation-intensive, would be to create an abstract animation to safely skip the player between each segment. They would still be be in the boat, but be pleasantly surprised to find themselves suddenly in a new space. It could involve directing the players attention away from the world and enveloping their view, akin to a magic trick. I’m leaning towards the second. The focused attention during the transition could be a great tool to layer in additional narrative. A poem or a letter to be read to clue in the player about the journey that they’re making.